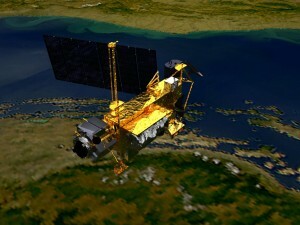 UARS was initially designed as a three-year mission to study the upper atmosphere and its interaction with the solar wind. The project resulted in several major scientific discoveries, including the confirmation of the role of chlorofluorocarbons (CFCs) in ozone depletion and the resulting chemical processes that cause the Antarctic ozone hole. Originally orbiting at about 360 miles (580 km) above the surface of the Earth, NASA decommissioned the spacecraft in 2005, placing it into a lower, “disposal” orbit, and its altitude has been gradually decreasing ever since. Most of the 7-ton satellite is expected to burn up upon re-entry, but NASA has estimated that about 26 pieces, some weighing up to 300 lbs. (136 kg) will survive the intense heat caused by atmospheric drag. These pieces will scatter somewhere within a 500 mile (800 km) fall zone. Although much attention has been given to the possibility of debris raining down on populated areas, chances of that occurring are extremely remote, according to Nicholas Johnson, head of NASA’s Orbital Debris Program Office. “Throughout the entire 54 years of the Space Age, there has been no confirmed report of anybody in the world being injured or severely impacted by any re-entering debris,” Johnson said. Decommissioning and removing spacecraft from orbit is rare. Over the course of 15 years of continuous spacecraft operations, LASP personnel have participated in such a process just once. In June 2010, NASA began decommissioning the ICESat mission and LASP professionals and students controlled the final descent of the satellite, which fell to Earth in the Barents Sea, north of Scandinavia on August 30. LASP presents students with a unique opportunity to become certified mission operators and to control spacecraft and instruments from our Mission Operations Center.